Welcome to Bob’s Flight Log. 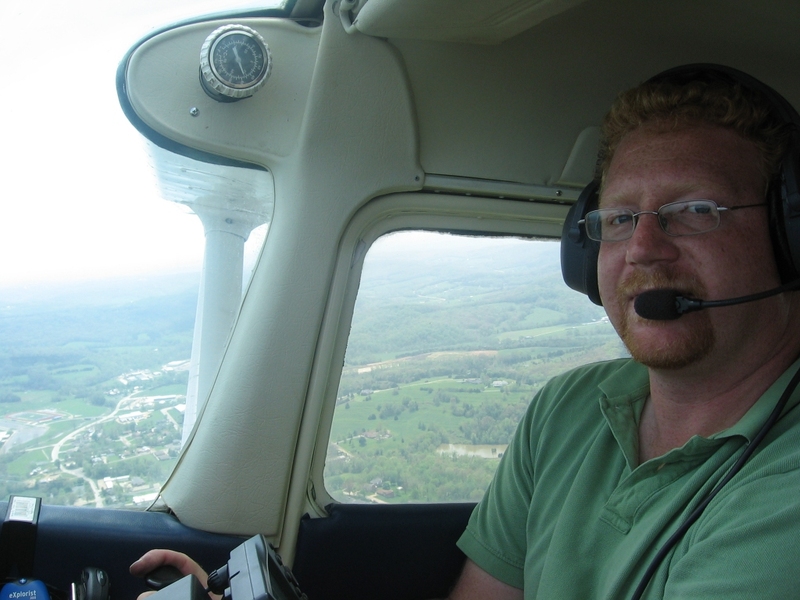 The purpose of this page is to share my flying experience with my friends and family, and to keep track of my maintenance and flight hours, as well as to log my personal notes. Enjoy! At 8:27PM the wheels of my plane lifted off the ground for the first time with me at the controls. I flew up to 312 feet and circled around the airfield and brought it in for a landing on the same end of the runway, and I can tell you from experience that it was the singular most incredible few moments of my life! I cannot begin to tell you all how cool that was! When I hit the throttle up to full, I was amazed at how much power it has! It just hammered me back into the seat as it accelerated down the runway...and lifted off in less than 100 feet. I was scared before I left the ground, but once I was in the air, my fear went away! When I turned for the first time, I saw the whole world just moving and turning below me, and it just reminded me how small everything is. How insignificant everything we do and see in life really is. Man...that was the greatest experience I have ever had. What a freakin’ blast! I cannot wait to do it again. I lined it up and brought it in for a great landing, although a bit bouncy, but not bad for the first time! My second flight. Still recovering from the unbelievable rush of flying for the first time just a couple of nights ago, I once again took to the skies tonight for a brief flight, lasting about 18 minutes. I circled around the field a few times and came in for another slightly bouncy landing. I took the camera up with me tonight and took most of the “BobFly” pictures that are in my aerial photos section. I flew for a half hour today, again circling around the field and learning to deal with a crosswind of about 5-10MPH. I had to ride left rudder in, but brought it in for a great landing, only bouncing slightly. Took off again and circled around, finally nailing a perfect landing! My first experience with rough air, the thermals were somewhat heavy today, and I felt some jarring and shuddering on ascent, and when I approached the Missouri River bank. Kinda scary at first, but I got used to it quickly enough. Landing was excellent. Performed major inspection on airframe and engine. Discovered locknut on the right inboard aileron hinge that was showing only 1 thread at the end of the bolt. Marked and monitored. There are three other bolts holding the aileron as well as a control horn connection, so no danger noted. By far my best day! What an amazing day this was! Many people were at the airport, including my buddy Mike with his powered paraglider. I took the camera up with me again today and took most of the “UL” pictures listed in my aerial photos section. 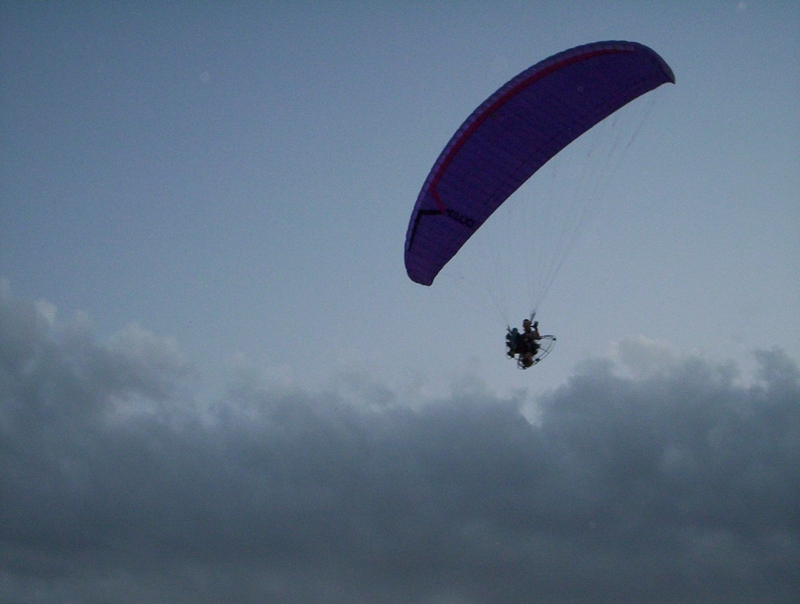 Mike went up and flew his paraglider along with me, so I got some really beautiful shots of him from the air. I flew for an hour, and got up to 600 feet AGL. The weather was absolutely perfect, with a very slight westerly breeze and the air was great with no thermal disturbances at all. I landed perfectly once, and then took off and flew for another 20 minutes or so, and came in for a second landing of the day, again executed perfectly. Days like this don’t happen very often. Short flight today. Air wasn’t that steady, and it was getting late. I got to watch a beautiful sunset from up in the air tonight, so it was a great day nonetheless! Another short flight day. I didn’t get out to the airfield until quite late, so I didn’t have much time to enjoy much more than a quick hop and a nice sunset. Air was very nice today. Life has been keeping me busy lately, but I did manage to get out to the airfield for the first day after many days of rain. The sky was very cloudy and the air was a bit rough, but nothing to worry about. I made my first flight over Rhineland today. It was neat seeing all the cars and people down below just living their lives. Again arriving at the airfield late due to life’s complications, I didn’t get much flying time in today. Today my buddy Matt and I attached a digital camera to my plane and made a movie. It was really cool, as he brought a second camera and shot a movie of me from the ground as I circled the airfield. He later patched the sequences together and made a movie which you can download and view here: Come Fly With Me! Just right-click and choose "Save Link As" in Firefox, or "Save Target As" in IE. The air was great today, and I enjoyed flying around and having fun with the cameras. I plan on doing some more flight photography in the future. Great flying today! I had a good time today pushing the elevation boundary as I get more and more experienced. I flew over Rhineland and up along the north bank of the Missouri River, coming within about 2 miles of Hermann. Stayed at around 500 feet AGL as I passed over the highways below. People at the gas station were waving at me, so I made a couple of circles to show off my status as master of the universe. Experienced some rough air today, although not too bad. I decided to practice some touch-and-go landings which basically means letting the tires touch down and then throttling back up and taking off again. I did 4 landings today, and nailed every one. I’m getting really good at this flying thing J. Great weather today. The sun was setting to the West, and I was really enjoying watching the shadows over the hills below. The treelines were casting dark green shadows over the bright grass and making a beautiful combination of greens. As the sun set through the light clouds and over the horizon, I felt a sense of freedom that I hadn’t had before. The air was very steady today, and almost no wind at all. Great flying weather. Had a bit of a scare when I was on approach. My windscreen above the wing joiners came off and was flapping in the wind. I didn’t know this at the time…I just heard a popping sound. Key when something like this happens is to just stay calm and work the problem. Never panic. It was a great flight though. I decided to practice some short approach landings today, so I circled the runway from tip to tip and landed in the middle 4 times. Performed major inspection on airframe and engine. No problems found. Marked all bolts and nuts on the airframe with a permanent marker for reference so that any loosening nuts/bolts could be easily detected. Today was another one of those rare flying days when everything was perfect. I took the day off work to enjoy some flying and that I did! I flew for almost an hour with my friends watching and had a blast! I took some more photographs. Just a quick hop-flight, since I didn’t have much time at the field. Today was a very special day for me! My wife Sandi was offered a flight along with one of the pilots at the airport, and she accepted. I was up flying around as I saw her and her pilot take off from the runway below. After the ascent, she got to fly around for a while and control the plane. It was such an amazing experience for her that it brought tears to her eyes! I felt amazed to be part of that memory with her. Some friends showed up at the airfield, as well as Bart and Nick Engemann of Engemann Aviation, the local flight training group. It was cool having Bart and Nick see me fly, knowing that I was self-trained. I felt proud showing them my stuff as I flew around and came in for a perfect landing. The air was unsteady today, with high humidity following a passing storm. It wasn’t too bad, so I enjoyed some good late evening sunset flying. The air was EXTREMELY rough today. The worst that I have seen yet. Although there was not much wind, the thermal activity and humidity were very high, so the air was heavy and unsteady. I took off into the East and buffeted quite a bit as I turned back West. I stayed low over the corn fields and actually considered setting down in a field it was so rough. I was bouncing around and buffeting quite a bit before I brought it in for a very tense landing, but smooth nonetheless. Great flying today! The temperature was perfect and the air was calm with a 10-15MPH North to South crosswind. 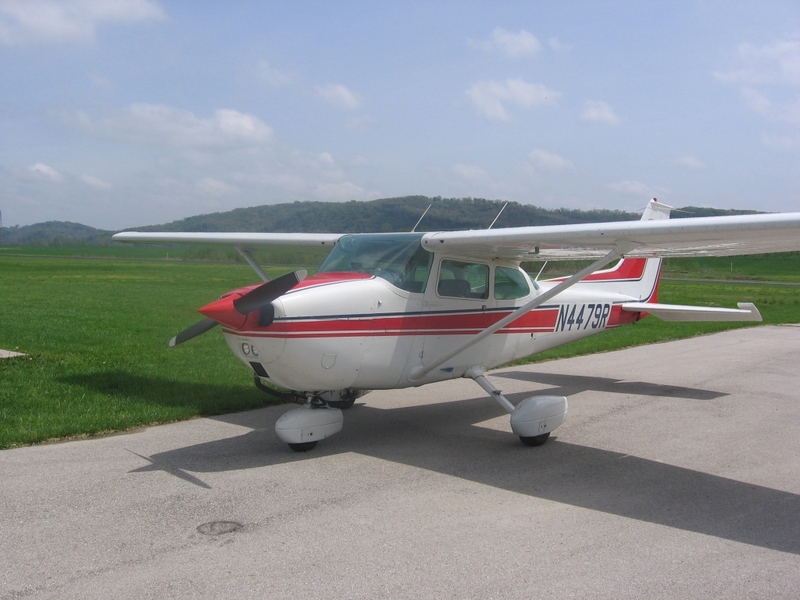 I practiced approaches and landings in crosswind, and found it to be fun! I had to hold right rudder almost at the limit for these approaches and I kept the upwind wingtip down. My approaches were textbook, and the wheels touched down so lightly that I barely even felt it J I think I’m really getting the hang of this. Good flying today. Air was slightly unsteady, but not enough to worry about. Slight crosswind. Unsteady air today. Again, there was high humidity and the sky was cloudy. It was also cold, so I circled the field a few times and brought it in. Today was a very exciting day. It was the first time I let somebody else fly my plane since I bought it in May. I asked Bart Engemann, the local flight instructor if he wanted to try out my ultralight, and he took my offer. It was really weird seeing somebody else fly it, as he handled the unsteady air with much more calmness than I had exhibited J. Today was absolutely terrifying! The air was the worst I had seen yet. I buffeted around shortly after takeoff, and immediately got an unsteady feeling as I circled around for the runway again. The whole plane felt like it was rising and sinking the entire time I was flying. Thermals can really make the air unsteady! I took a camera up with me today and actually held it in my hand as I flew around. You can check out the movie HERE. You might need Apple QuickTime Viewer which you can download HERE. I flew over the gas station just Northeast of the airport and waved at some people, and proceeded South following highway 19 over the river and over Hermann, turning back North and heading back toward Rhineland. Great flying! It’s starting to get really cold on these flights! I had a pleasant flight, but my hands and ears were hurting from the cold Fall air. Again, it was very cold today. I had my better gloves this time, so it wasn’t all that bad. Good flying and steady air. Well, I know it’s nearing the end of my flying season, but Mother Nature decided to give us a break of almost 50 degree weather and steady air, so I took advantage of one of the last times I was going to fly for the year. Today is my 40th birthday! I decided to brave the mid 40’s weather and come out and fly. The air was calm and cold! A quick break in the cold gave me my last chance to fly for the year. The air was pretty rough today, but manageable. Performed major inspection on airframe and engine. Noted that the parachute was not mounted as safe as it should have been, so I remounted the chute cord, and fastened the pack better. A ziptie had come loose on the main wing joint and some wires were hanging free. Fastened new ziptie. Also began working on a camera mount for flight movies. My purpose in going to the airport tonight was to test out my new camera mount which you can check out by clicking on the picture below, but the weather and crosswinds made for a very unpleasant evening for ultralights, so I just took it for a quick hop. Unfortunately the camera kept shutting down, so I didn’t get to check the mount. However, I did have a really cool thing happen tonight! My friend Gary Giesler showed up and I got to fly his Cessna Centurion. Check out the movie I made right HERE. My camera mount idea didn’t work so well tonight…the digital camera kept turning off. I guess the airframe vibrations were causing it. I will get a different digital camera. Anyway…I had some great fun flying tonight. I went up for three short flights and brought it in to land, and then went on a final flight of about a half hour. The air was very calm and nice. My first good flight of the year. Hopefully I will get this camera mount figured out before long J. I also got to fly along with Bart in his Cessna 172 for a while. Got out to enjoy the evening air tonight. The fuel tank was a little low before I started, so I had to run back into town to get gas before I could fly, so I didn’t get to enjoy as much as I thought I would. I made a movie of tonight’s flight which you can view HERE. The air was very calm and not too cold to enjoy. I really wish I had more time tonight. Another great night for flying. About 20 minutes into my flight, a front showed up on the horizon and the wind started to pick up, so I had to bring it in early. Perfect landing tonight, barely felt the wheels touch down. I did not know that this would be my last flight in my AeroLite, but I sold it to move up to a two seater sport plane, the Rans S6ES. I’m really going to miss my AeroLite. 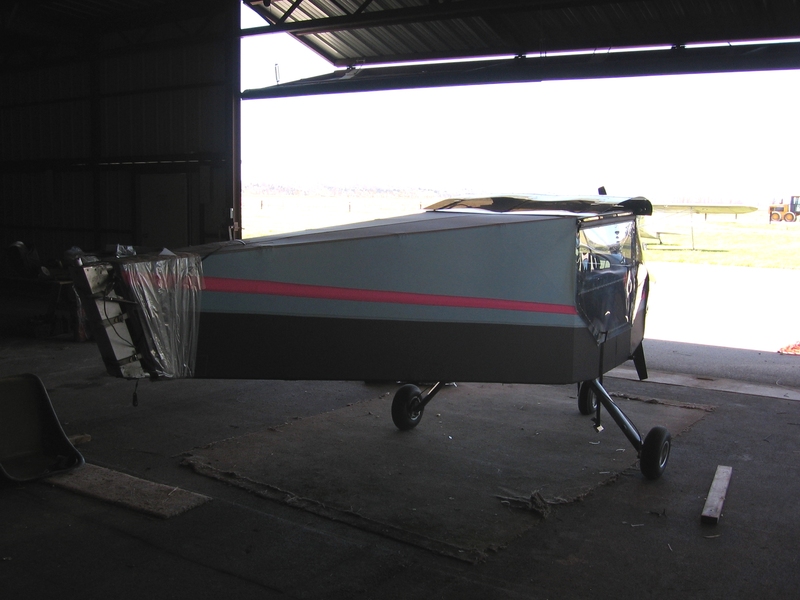 It was the first plane I ever flew solo, and it will always be remembered J Anyway…on to newer things. I estimate my project to take about a month. Lonnie and I got the wings installed tonight. I got the new skins ordered for the tail as well, and they should be in within 10 working days. Went up with Bart Engemann tonight in his Cessna 172. Flew to Washington Airport just outside of Washington Missouri from Hermann, and observed a strong crosswind landing technique. Got up to 4500 feet and checked out some great scenery as well. It was a fantastic flight and a lot of fun! Performed major inspection on airframe and engine. I finally finished my plane, got everything tightened and did my inspection. No problems found. Marked all bolts and nuts on the airframe with a permanent marker for reference so that any loosening nuts/bolts could be easily detected. I got a little braver today, and after talking to a lot of Rans owners, and deciding that I just need to get used to how sensitive it is…I flew around the pattern today, getting up to only 500 feet as I circled the airport. Brought it in for a great landing! The air was fantastic tonight. It was cool, calm, and dry, and the absolute best conditions to fly I can remember. I got up to 2200 feet and flew around the Hermann – Rhineland area. Today I got comfortable with the controls, doing many coordinated turns and did some climb rate tests as well. Perfect landing! Great flight tonight, but had to deal with thermal problems, so didn’t get to fly too much. Not my best landing either, but not too bad! Today was my very best day in my new plane! I had a fantastic time. I got off work this morning and went right to the airport and took to the skies. I made a great movie which you can see HERE and on the homepage and the movies section, and I took some new aerial photos for the gallery.